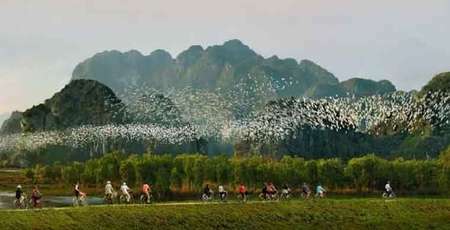 Tam Coc Bich Dong tourist area currently has a natural area of 350.3 ha, located 2 km away from 1A highway, 7 km from Ninh Binh city, 9 km from Tam Diep city. Mainly located in Ninh Hai commune (Hoa Lu). Tam Coc Bich Dong tourist area includes many sightseeing routes for yachts, cycling and walking, connecting nearly 20 tourist destinations. It is possible to go to Tam Coc Bich Dong around April, the weather is relatively dry at the time, there is no more unpleasant heat and humidity in the North of the year and not too sunny nor rainy, so 2 hours of boat ride will not must be something too annoying. 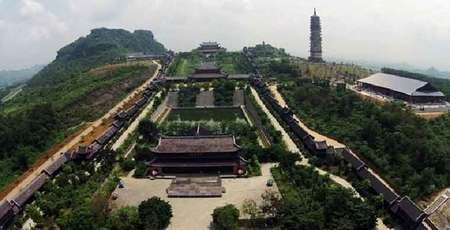 From March 1st to 3rd (Lunar Calendar) is Bai Dinh pagoda festival, you can combine the ceremony and explore Tam Coc Bich Dong on this occasion. If you want to go to Hoa Lu, remember the 8th day of the third lunar month every year, this is the time of the Truong Yen festival. At the end of May and early June, it’s the rice harvest in Tam Coc Bich Dong field, when the green rice fields mixed with golden rice fields creating such a beautiful color. Only 7 km from Ninh Binh city, so you have many ways to get to Tam Coc Bich Dong. If you don’t have a personal mean, the plan is to take public transport or to rent a motorbike. You can catch buses on the street or rent a bike in any hotel and many coffee shops. Ninh Binh is an important intersection point, with 9 national highways (including 6 starting national highways and 3 passing national highways), spread evenly across all districts, cities and towns in the province, so the most convenient way to get to Ninh Binh is through the road traffic system. The bus routes to Ninh Binh from Hanoi are from Giap Bat bus station and end at Ninh Binh bus station. 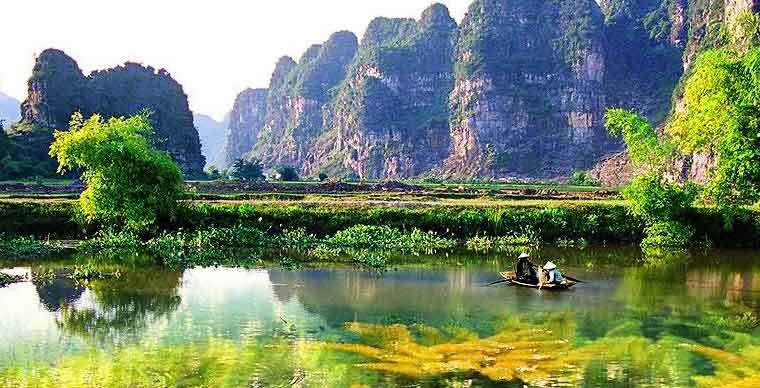 Because Ninh Binh City is also located right on the National Highway 1A, apart from these routes, you can use any other bus that goes from Hanoi to the Central or Southern provinces such as Thanh Hoa, Vinh, Ha Tinh. 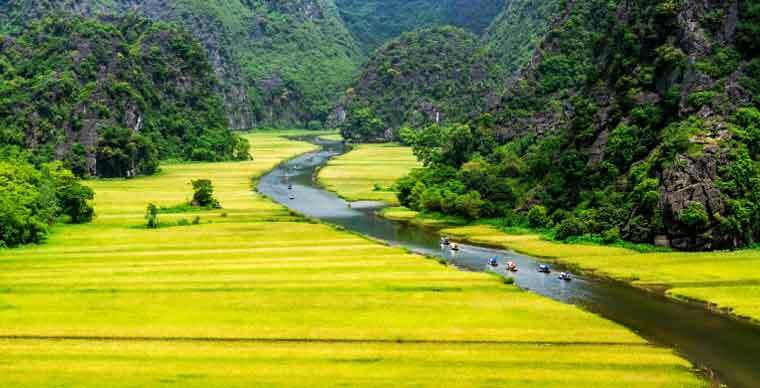 If you use car, from Hanoi you can follow the highway Phap Van - Cau Gie - Ninh Binh, with a distance of about 90 km which takes about 1 hour and 20 minutes to reach the center of Ninh Binh city. From here all the tourist destinations in the province is in the radius of 30 km. If you use motorbikes, from Hanoi you go along the old NH1A road through Ha Nam and follow the direction of Ninh Binh - Thanh Hoa. Ninh Binh Station has now been upgraded a lot. Ninh Binh has Tam Diep - Ninh Binh urban axis located on the North-South railway. There are Ninh Binh stations, Cau Yen station, Ghenh station and Dong Giao station in the province. 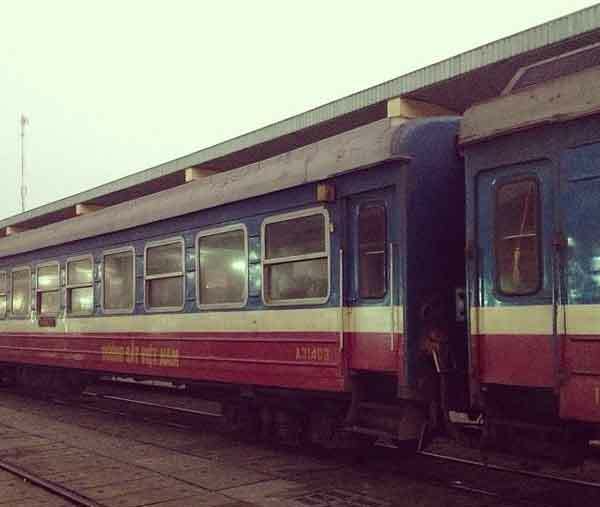 Therefore, you can easily come to Ninh Binh by using Thong Nhat train. From Hanoithere are SE1 (19:30) to Ninh Binh at 21:46, SE3 (22:00) to Ninh Binh at 10:10, SE5 (9:00) to Ninh Binh at 11:21, SE7 (6:00) to Ninh Binh at 08:22 and SE19 (20:05) ship to Ninh Binh at about 23:00. From Saigon, the trains will all arrive in Ninh Binh almost late, the only suitable train that you should go is SE8 departing from Saigon station at 6:00 and arriving in Ninh Binh at 13:15 on the day after. From Ninh Binh city center to Tam Coc Bich Dong is quite close, if you simply want to come here and then return, you can hire a taxi or motorbike taxi, with a group of about 4 people, it only takes a few dollars. If you want to combine to go to many other tourist destinations in Ninh Binh, you can consider renting a motorbike in Ninh Binh and then follow an arc schedule to go all the points, basically not too far apart where. Tam Coc Bich Dong area is one of the tourist destinations with a lot of homestays. Because the distance between Hanoi and Ninh Binh is quite close, you can completely go and return in the day. 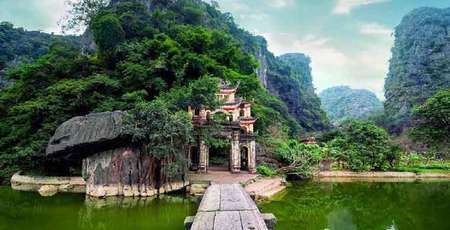 However, if you want to stay overnight, there are many hotels for you to choose from in Ninh Binh. Tam Coc - Bich Dong has a quite good hotel and homestay system. They are mostly in Tam Coc wharf area, Ninh Binh tourist village and on the route from Tam Coc to Bich Dong. Places to visit in Tam Coc Bich Dong. Tourists traveling to Tam Coc only have a single waterway, which takes about 2 hours to get out. Arriving at the communal house in Van Lam village, going to Ngo Dong river wharf - the waterway leading to Tam Coc. 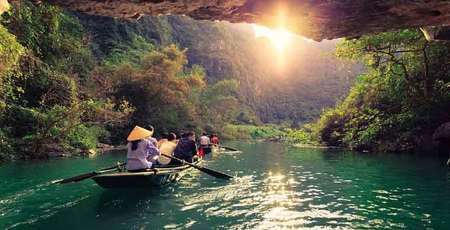 Tam Coc, which means "three caves", consists of Ca cave, Hai and Hang caves. All three caves are made up of the Ngo Dong River that pierces through the mountain. 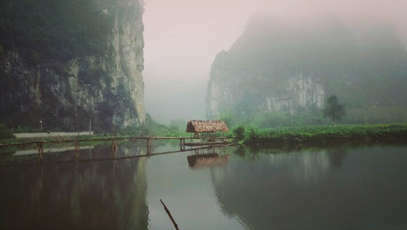 Tam Coc is the first exploited cruise line in Tam Coc - Bich Dong. - The Ca cave is 127 meters long, passing through a large mountain, the cave is over 20 meters wide. In a cool climate cave, there are many stalactites in various forms. - Hang Hai (60 meters long), nearly 1 km away from Ca cave which is claimed to have many strange stalactites. Want to visit Tam Coc, visitors have to get off the boat from the central station to go through the cliffs, caves and rice fields. The time for going and returning is about 2 hours. 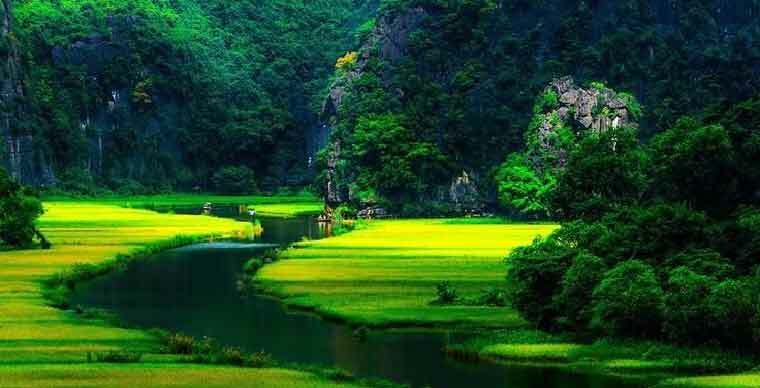 Tam Coc landscape, especially 2 on Ngo Dong river can change according to the season of rice (green rice, yellow rice or silver color of water in the field). Thai Vi Temple is the place to worship King Tran Thai Tong, Tran Thanh Tong, generals Tran Hung Dao, Tran Quang Khai and Queen Tran Thi Dung. 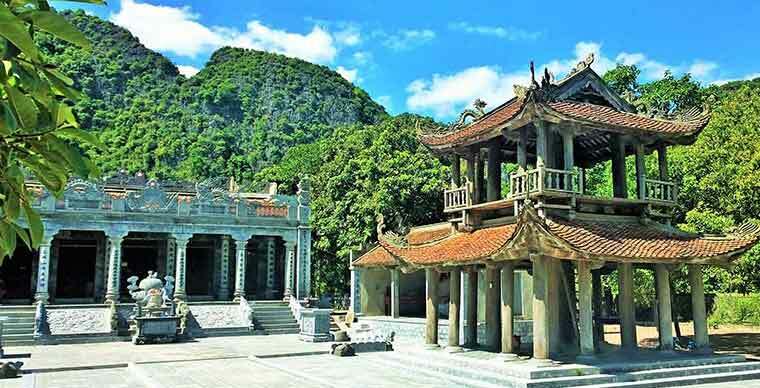 In the old Tam Coc mountain area, the Tran dynasty built the palace called Vu Lam in the resistance against Nguyen Mong. Burnt rice is not a traditional dish of Ninh Binh people, but it was kept and developed until now. 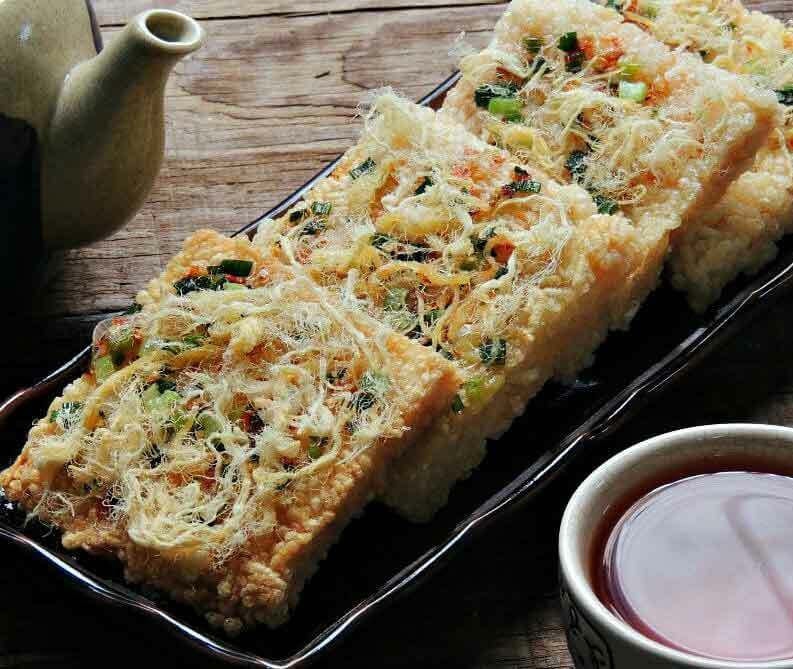 A rustic dish, showing the dexterity of human hands, has been handed down for hundreds of years, becoming a specialty of the ancient land, one of the famous delicacies of Ninh Binh. Ninh Binh goat meat is sturdy, low fat and tasty because in Ninh Binh there are many rocky mountains, goats run and jump a lot so the muscles are firm, less fat than the grazed goats on the hill. On the other hand, with the typical topography of the limestone mountains, there are many types of vegetables, grass and herbs which boost the taste and the quality of goat meat to the next level. Some other local ingredients and specialties also contribute to highlight Ninh Binh goat meat, including vegetables with topographical characteristics of rocky mountains, Kim Son wine, Nho Quan wine and Ninh Binh burnt rice. 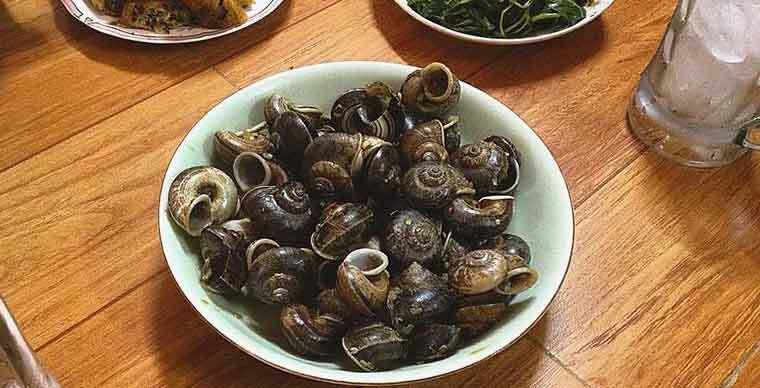 Ninh Binh mountain snail meat is usually thick, with a typical flavor due to eating all kinds of moss, leaves and roots of forest trees. Ninh Binh snail is extremely rare because they only live in caves, until the rainy season from April to August, the snails crawl to find food and breed. Mountain snails are found in most places in Ninh Binh province but concentrated mainly in Tam Diep, Yen Mo and Nho Quan limestone mountain ranges. Mountain snails are difficult to find, people often have to wake up early in the morning when snails come out of the cave catch them. The snail meat is tough, crunchy, sweet, fragrant with the medicinal herbs. Mountain snails can be processed into many dishes such as grilled, fried tamarind, steamed with ginger, boiled or drained.